Seeing commercial stoves in a house always makes me drool! The rest of the kitchen is very nice looking. Roomy as well. Good Work! Beautiful! So fresh & clean looking! I really love the way the under cabinet lighting makes the tiles pop!! Very nice! Under cabinet lighting always looks amazing. I love the ceiling!! 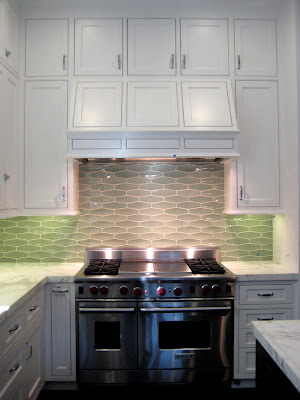 What a gorgeous kitchen, I love the back splash tile, thanks for naming the source. Reminds me of an updated subway tile look, which goes well with the craftsman feel. I know this was posted awhile ago, but by any chance do you know what color tile this is? Heath has so many different greens! Thanks! Hi Callie, The Heath tile color is Pisces. They have so many colors to choose from, I know! 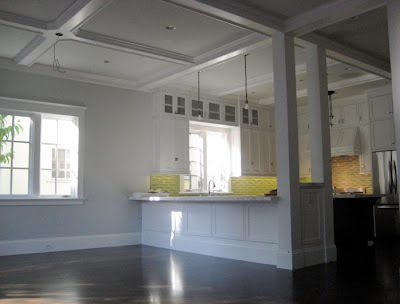 I love white painted kitchens! Although, they may be a bit harder to maintain but the pure white looks really clean and tidy. What material is the kitchen counter? I'm coveting Carrara marble (which this looks like), but fear the upkeep isn't a good fit for a family of little kids. If this is Carrara, do you have a recommendation for a more stain/etch resistant counter that will also work well in a white shaker kitchen remodel. Our peninsula will also border the dining room and I want it to work seamlessly with the rest of our 100 year old home. Thanks! Thanks for your note. 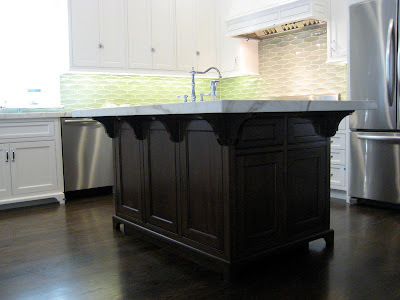 The kitchen counter here is Calacatta marble, which is similar to Carrara, but has more warm beige tones to it. If you don't mind the patina, marble can look great when it's a little "lived in." Otherwise, if you want something more durable, there are quartzite stones that immitate the look of marble, like Silestone Lagoon. I also like Absolute Black granite in a white shaker kitchen.